Mourners hold a wake for 11 family members who were killed inside the Santiago Apostol church during the 7.1 earthquake. ATZALA, Mexico — A child’s baptism turned into tragedy when the roof of a church collapsed as a powerful earthquake shook central Mexico. Eleven members of a family died, including the 2-month-old girl being christened. The only survivors were the girl’s father, the priest and the priest’s assistant, the Archdiocese of Puebla said Wednesday. At least four minors were among the dead. “It was a scene of horror, sadness with most of the people inside the church dying,” priest’s assistant Lorenzo Sanchez told The Associated Press. Sanchez said those who survived moved to the edges of the church when the swaying started while those who died didn’t have time to do so. “One of the things they taught us is to stick to the firm walls of our church, which is old and its structure a bit deteriorated,” he said. When the ground stopped shaking, people called for help using loudspeakers and residents of nearby communities quickly arrived in Atzala with shovels, pickaxes and chains to haul away rubble. They dug for hours through the crumbling remains of the Santiago Apostol church but found the 11 relatives had died. Covered in dust and exhausted, the rescuers laid the bodies out on the same street where a party was meant to be held after the baptism. They covered them with canvas to protect them from the rain. 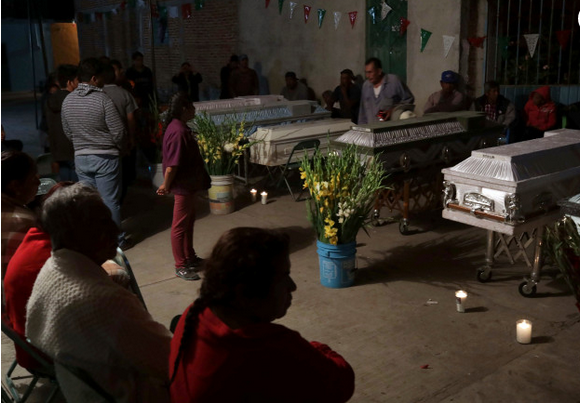 Family members of the dead traveled overnight from other states to attend Wednesday’s wake in Puebla, the state capital where mourners said a final goodbye to their loved ones. Each coffin had a name attached: Florencio, Fidela, Aurelia, Manuela, Maria de Jesus, Carmen, Samuel, Azucena, Feliciana, Susana and Elideth — the girl who was to be baptized. Tuesday’s magnitude 7.1 quake was centered in Puebla state, where it killed more than 40 people. Across Mexico it killed more than 200 people. In Mexico City, rescue efforts continued Wednesday at a primary and secondary school where 25 bodies had been found and a young girl was located alive amid the rubble.